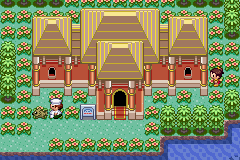 In the Battle Palace, the trainer plays a standard, single three-versus-three battle. However, the trainer can't decide which attack that his Pokémon uses. Depending on their nature, they will like certain kinds of moves (offensive, defensive, or supporting). The attitude of the Pokémon may change if their health is low. After 21 and 42 consecutive wins, the trainer can fight Palace Maven Spenser. Respectively, Spenser will award the trainer the Silver Spirits Symbol or Gold Spirits Symbol, depending on how many times the trainer has seen him previously. Spenser's name comes from spirit, which the Battle Palace tests.